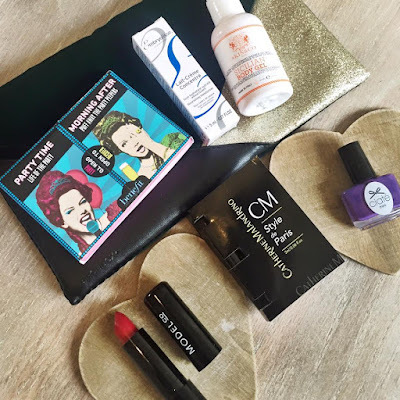 I am loving the December Birchbox this month, I love how this month the products have been sent in a pretty clutch instead of the normal boxes, It makes it feel more luxurious and special. Puff off and They're real push up liner, The samples in this little kit are such a good size, I was expecting tiny little sachets but you just get mini products which I love, I have tried the pushup liner before and loved it so I am excited to try out the puff off the morning after a night out. This lipstick is such a gorgeous vibrant red which swatched so smoothly and the colour pay off was amazing, This lipstick would look so amazing for a christmas or new years party. I am most excited about the fact this product has a semi-matte formula which is supposed to increase its durability. I was so excited when I saw this was in this month birchbox as I have heard amazing things about this brand and have wanted to try it out for such a long time, I was so lucky to get such a pretty colour which I love (its currently on my toes). It apples like a dream, and the sample size is so amazing!! This moisturiser is a cult classic which I have heard endless good things about. I am so excited to give this product a try. What I like about this product is it have a very subtle Aloe Vera scent, Im not too keen on moisturisers with strong scents so this one is pleasant but not over powering. I must say Im not too keel on this products, when I used it in the shower it lathered up well on my skin which I liked but I wasn't too keen on the scent, I prefer Sweet scents. Although it had a fan cities smell to it which I normally like it smelled like chemicals, I can't explain it but I know I'm not immersed haha! I love this months BirchBox, I hope Januarys is just as good!